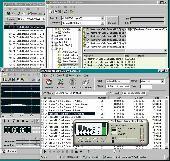 The XSD editor is a cross-platform XML editor. Although it can be used to edit any type of XML file, the Editor is specifically designed to allow easy creation, editing, and validation of XML Schema (Xsd) files.This project was registered on SourceForge.net on Dec 20, 2008. Altova XMLSpy 2009 Standard Edition is an entry-level XML editor for viewing, validating and editing XML documents. It is the perfect tool for users who need to view XML, DTD, XML Schema, XSLT and XQuery files and perform light-weight editing tasks.